There seems to be a correlation between national income inequality and guard labor. The number of security guards in the United States has increased from about 600,000 in 1980 to more than 1,000,000 in 2000. These figures represent a steep increase from earlier years. In 1960, there were only about 250,000 guards, watchmen, and doormen, according to the Census Bureau (which used a different occupational classification scheme than is used today). The Bureau of Labor Statistics reports that the number of U.S. security guards has increased by almost 100,000 since 2010, to a total of more than 1.1 million. As a measure of how paranoid and unwelcoming we are as a nation, security guards outnumber receptionists by more than 100,000 workers nationally. Sam Bowles and Arjun Jayadev argue that we have become “one nation under guard” and say that the growth of guard labor is symptomatic of growing inequality. The U.S. has the dubious distinction of employing a larger share of its workers as guards than other industrialized nations and there seems to be a correlation between national income inequality and guard labor. At the top of the list is Las Vegas. While the typical large metro area has about 8 security guards per 1,000 workers, Las Vegas has 19 per 1,000. Miami ranks second, with more than twice as many (18 per 1,000) as the average large metro. 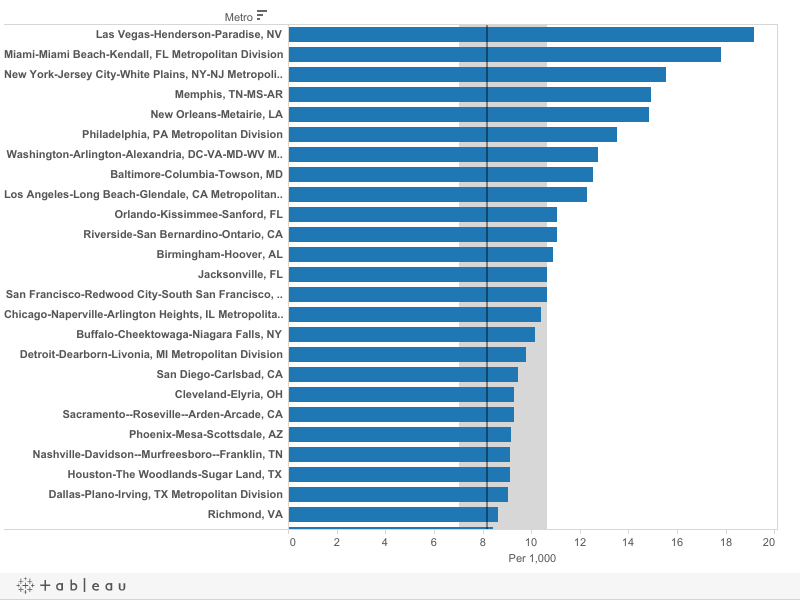 Other cities with high ratios of security guards to population are Memphis, New Orleans, Miami, and Baltimore. Washington, D.C., with its high concentration of government offices, defense and intelligence agencies, and federal contractors, also has a high proportion of security guards. It seems somewhat paradoxical, but the salaries paid to security guards get treated as a net contribution to gross domestic product. Yet, in many important senses, security guards don’t add to the overall value of goods and services so much as they serve to keep the ownership of those goods and services from being rearranged. As Nobel Prize-winning economist Douglass North has argued, we ought to view the cost of enforcing property rights as a “transaction cost.” In that sense, cities that require lots of guards to assure that property isn’t stolen or damaged and that residents, workers, or customers aren’t victimized, actually have higher costs of living and doing business than other places. These limits on easy interaction may stifle some of the key advantages to being in cities. This article originally appeared on City Observatory.